What a wonderful afternoon! 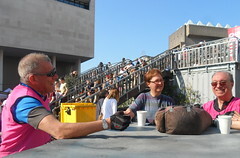 The weather helped, of course. Our combined ride with Islington Cyclists to the Southbank was a great success. 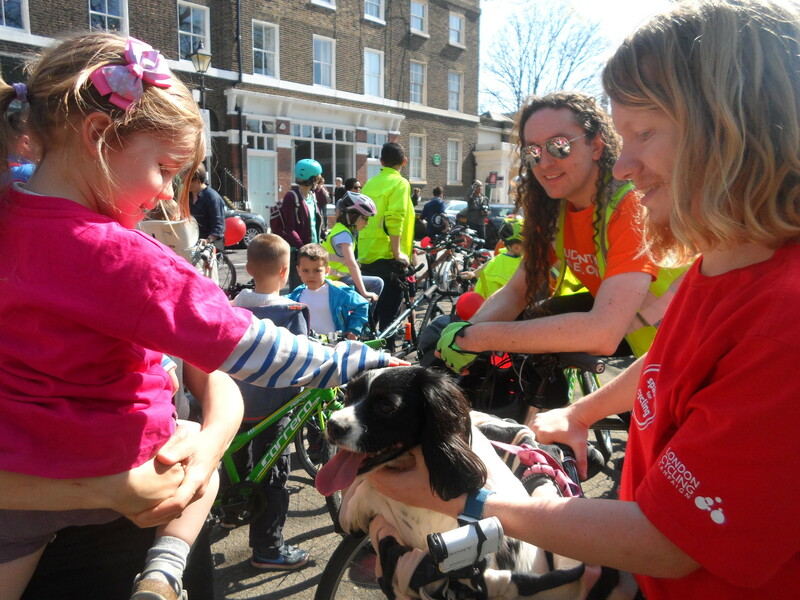 I don’t know if we’ve had much in the way of cross-borough collaboration on rides before. 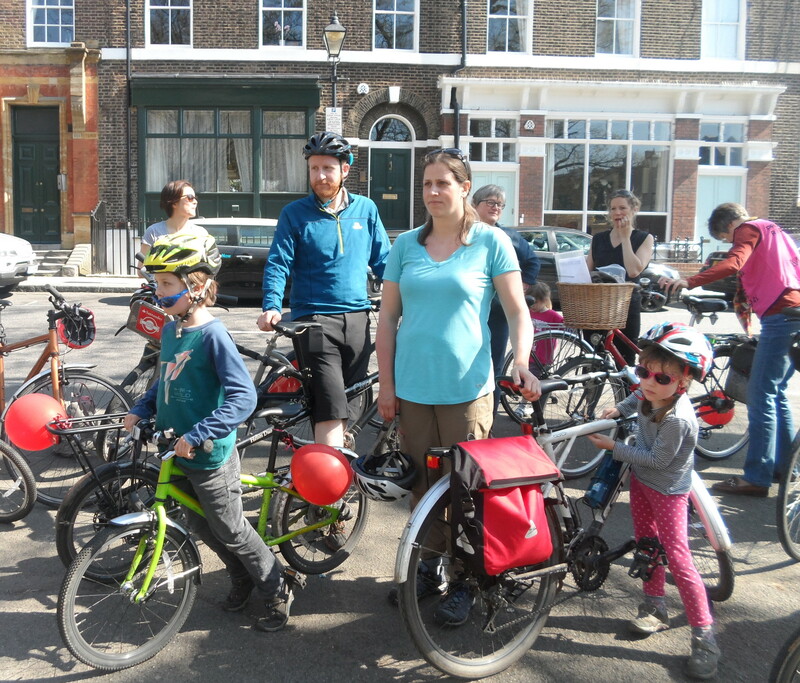 We’ve always had the occasional rider from neighboring boroughs like Brent and Barnet, but this time we wanted to do it en masse. 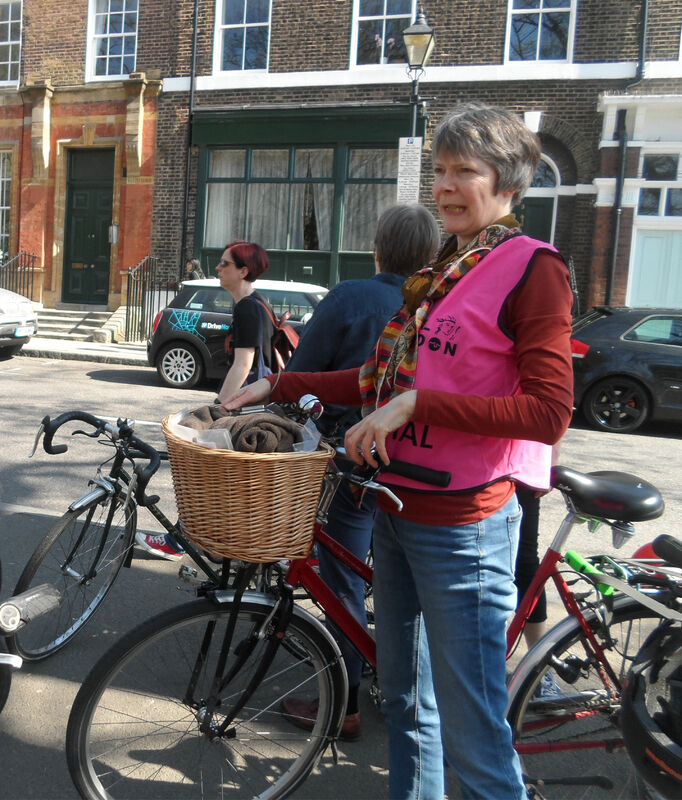 It was Alison Dines, the Cycle Islington coordinator, who first suggested other boroughs should join Islington for their Spring Ride to the Southbank. We at Camden were all for it. 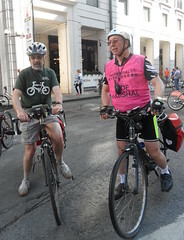 John Chamberlain and I reconnoitred the ride one Sunday and found that for the people starting in Highbury it was only a gentle afternoon ride of ten miles in all, it was 19 miles for us in West Hampstead. Still, the evenings are still light and we could take a little longer, and you could always get a train back from Blackfriars if necessary. 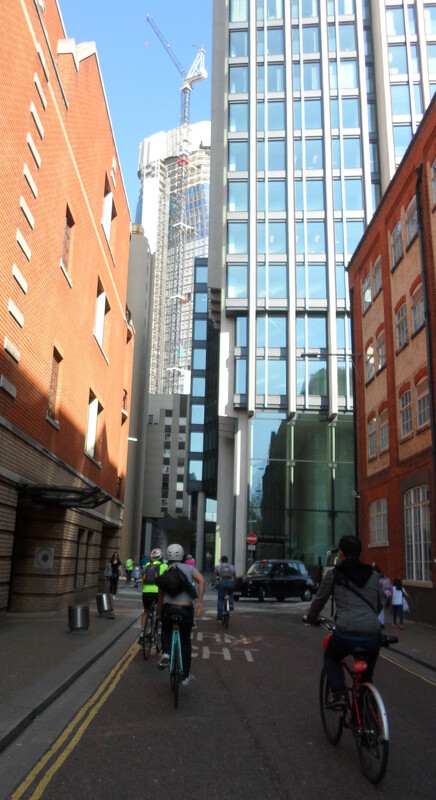 There were three possible starting points. 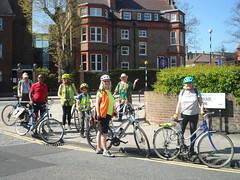 For those in the West of Camden the first starting point was Sidings Community Centre in West Hampstead. 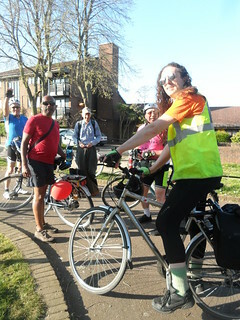 Five riders joined me there: my friend Jenny from Camden, Doreen from Westminster, and Ruth, Jiten and Michael from Brent. 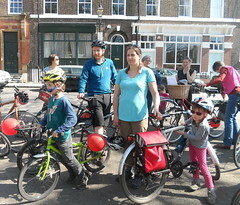 We met Juliet and Leo at the corner of Fitzjohn’s Avenue and Belsize Lane. we cycled across to the second meeting point at the Parliament Hill tennis courts, Highgate where there was John with a larger group of riders. 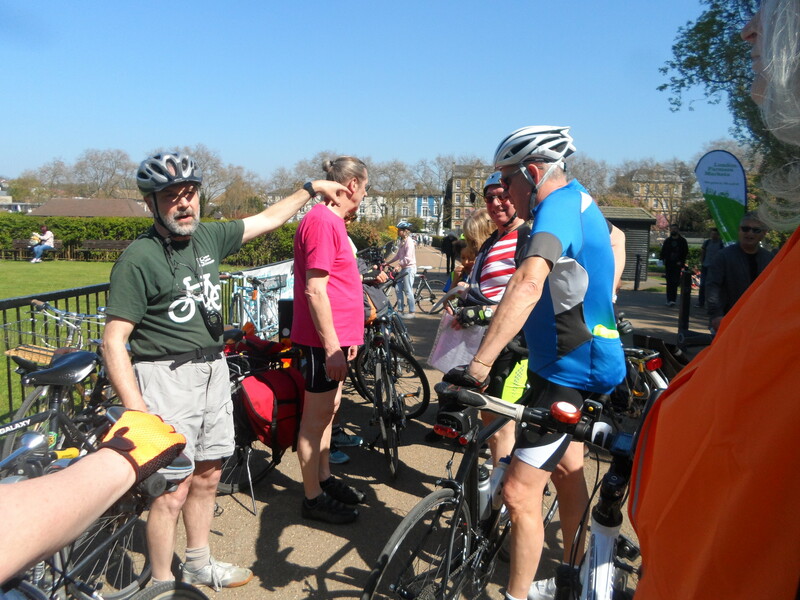 There seem to be more cyclists in the east of the borough, although Dave just missed us at Sidings and managed to beat us there. Now we were 18. Taking the same route as John’s Lee Valley Ride we made our way over to Islington. 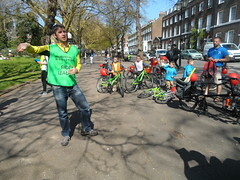 Employing blockers at junctions we proceeded safely to Highbury Fields where we encountered a large number of people eager to ride. We introduced ourselves to Alison Dines, the Islington Coordinator, and Simon Izod, the ride leader. 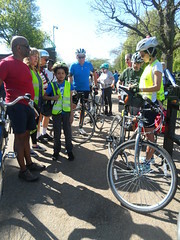 During the briefing we became aware there were a lot more boroughs represented than we expected. 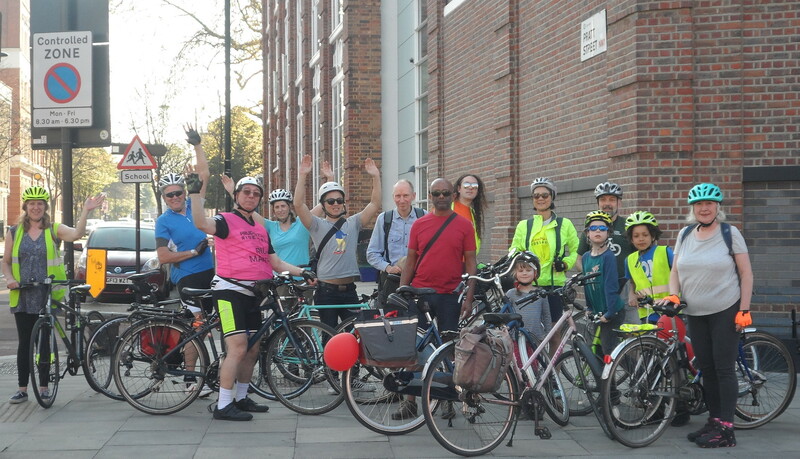 There were riders there from Islington and Camden, Brent and Westminster, Hackney and Haringay, Barnet and Waltham Forest (if I’ve left any out please let me know). One person counted 50 riders present but later in the ride I heard the larger figure of 63. 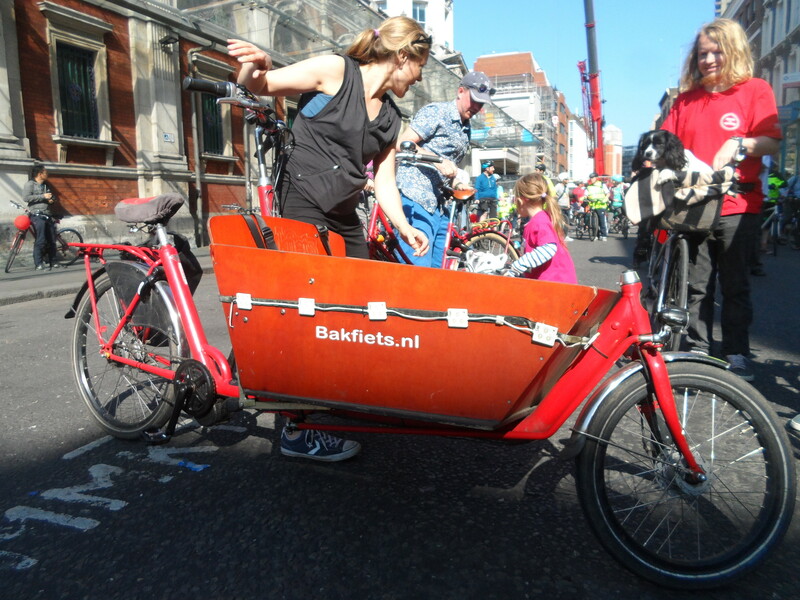 These ranged from children as young as six — riding their own bikes, on the back of tandems with mums or dads and one in a cargo bike — and adults as old as sixty-five, possibly older. 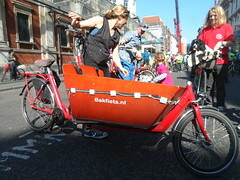 There was even a dog, being carried in a basket on the front of a bike, who barked all the way round. 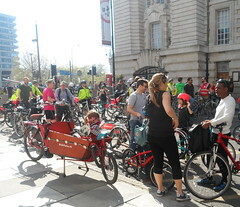 Let’s say a large number of cyclists backtracked a short distance and then ventured south towards the city. 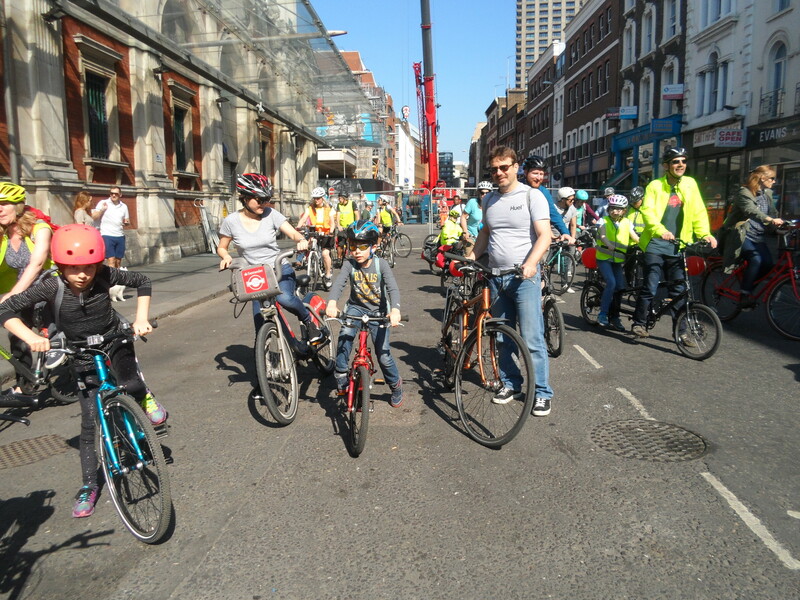 It was a relatively straight route on mostly quiet roads, including protected lanes on Skinner Street in Finsbury, down to Smithfield Market where there was some work being done and we all had to dismount and walk our bikes past an enormous crane. 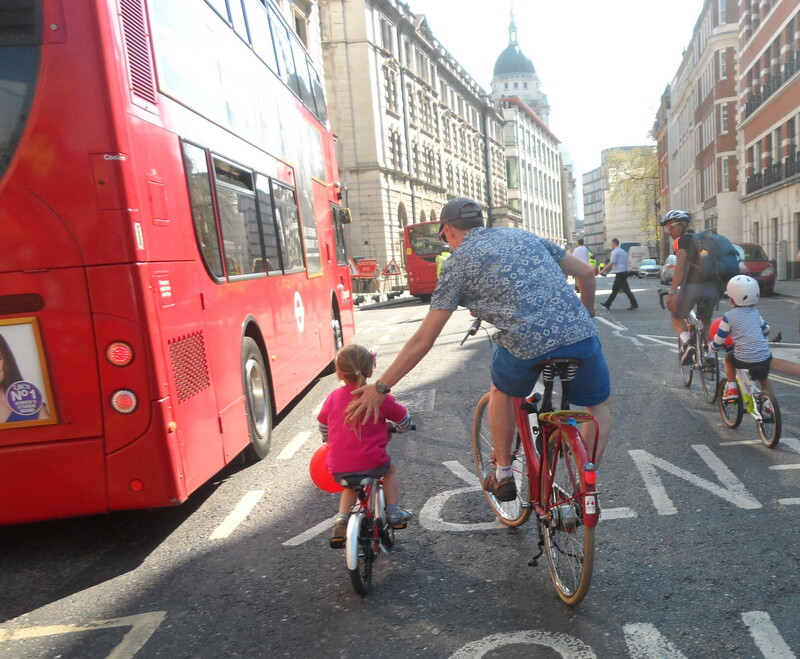 Passing The Old Bailey we came out on Farringdon Street where the North-South Cycle Superhighway CS6 begins. 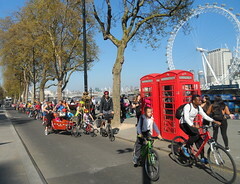 This took us down to The Embankment on the north side of the Thames. 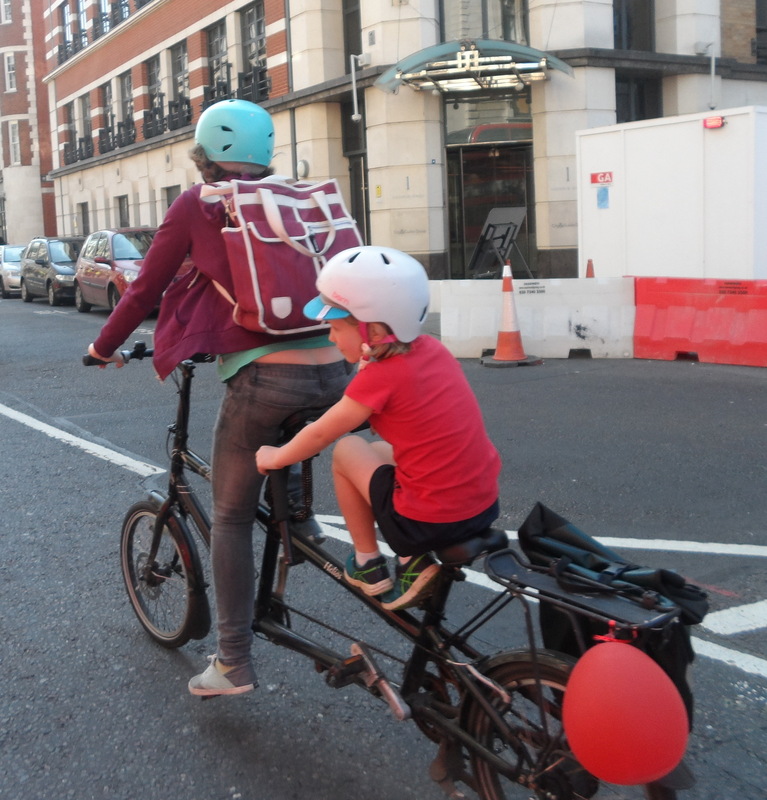 Here we joined the East-West Cycle Superhighway CS3. This was a fantastic part of the ride where we were able to cycle and observe some of the most iconic sights in London: St Paul’s Cathedral (if you looked back), The London Eye and the Houses of Parliament; and we were protected from all motorised traffic. 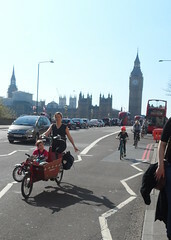 Westminster also had some roadworks going on in Bridge Street so progress was slow. We were remarking on the fact that these Cycle super highways had become a victim of their own success as they were becoming congested as more cyclist used them. 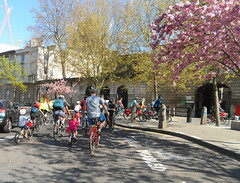 Just after crossing Westminster Bridge we turned into the relatively quiet haven of Belvedere Road behind the old County Hall. 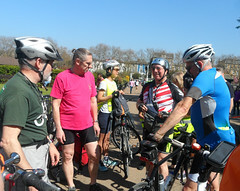 Here we were given 20 minutes to have a comfort break and refreshments. A few of us went a bit further on to the back of the Royal Festival Hall where there was a large number of street-food traders where we had a cup of something and some cake. 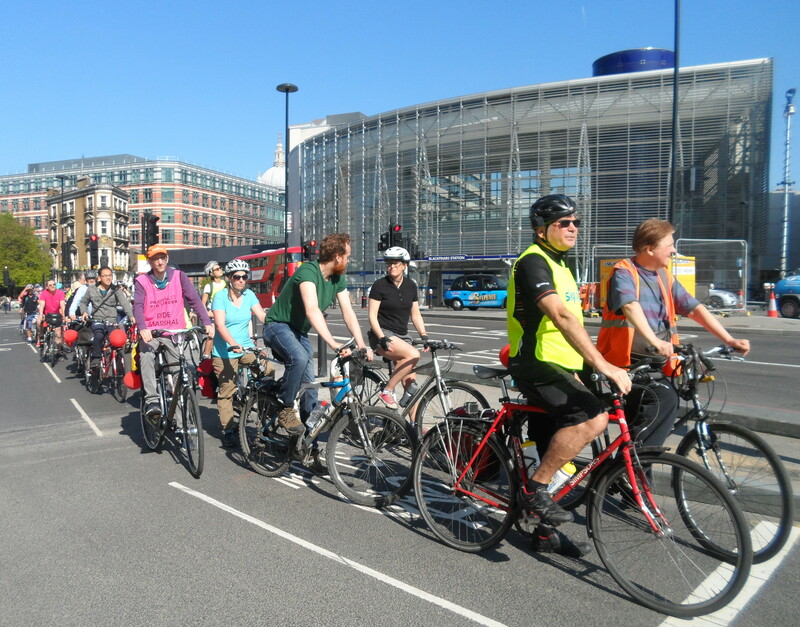 At 4pm we gathered together again to continue the journey home. 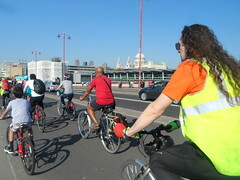 We noticed a few people weren’t with us so I rounded up the stragglers and led them back to Blackfriars Bridge and we rejoined the main group a little way up Farringdon. 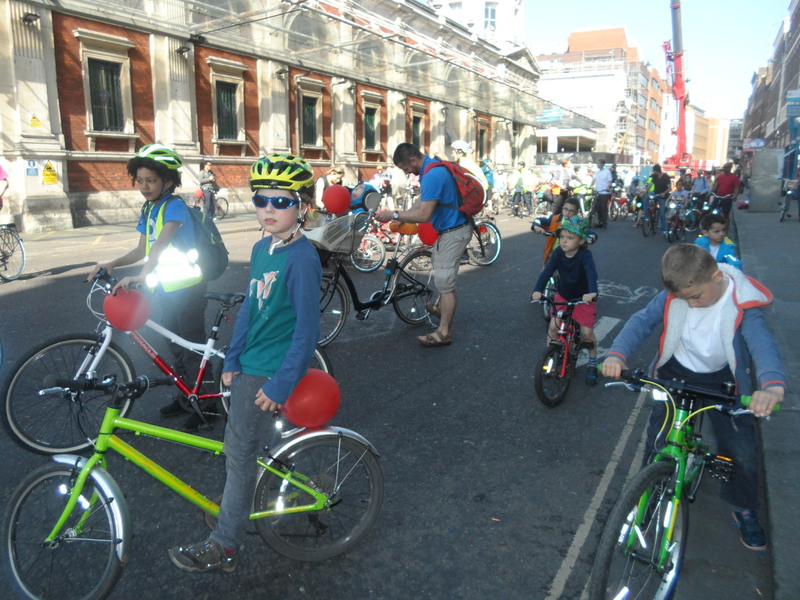 Along here we encountered a set of lights (probably the junction with Fleet Street) which only allowed about 20 seconds for bikes to pass. 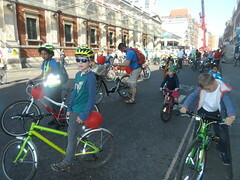 It took about five conplete changes for the whole group to pass through. We hoped that didn’t happen during rush hour. Just after this we turned off Farringdon up St Bride’s Street to Hatton Garden. 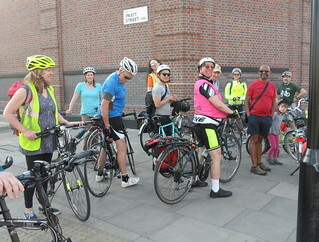 When we reached the main Royal Mail sorting office at Mount Pleasant we said goodbye to the Islington Group who turned right up Rosebury Avenue while the Camden crew went straight on. A bit further on we used the East-West protected cycle lanes along Tavistock Place. We crossed the Euston Road into Ossulston Street and up through Somers Town to more protected cycle lanes along Royal College Street. At Pratt Street we parted ways with John’s group returning to Parliament Hill. 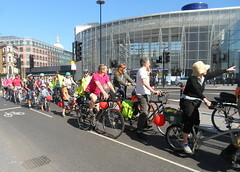 We were saying goodbye to individuals and groups at various points along the route as people got close to their destinations. 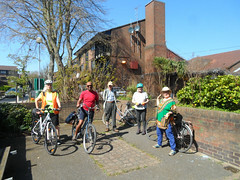 The Sidings group went up Gloucester Avenue and King Henry Road. As there were only experienced cyclists left in the group, we braved crossing Swiss Cottage Gyratory and back to Sidings through the filtered back streets of West Hampstead. 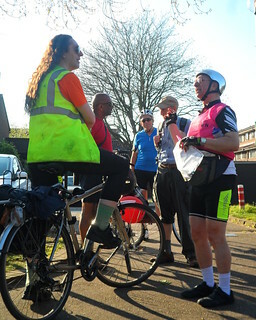 When we arrived back at Sidings (before my estimated time of 6pm) we realised that we still had a rider with us who didn’t start there. When we enquired where he lived he surprised us by saying Holloway. 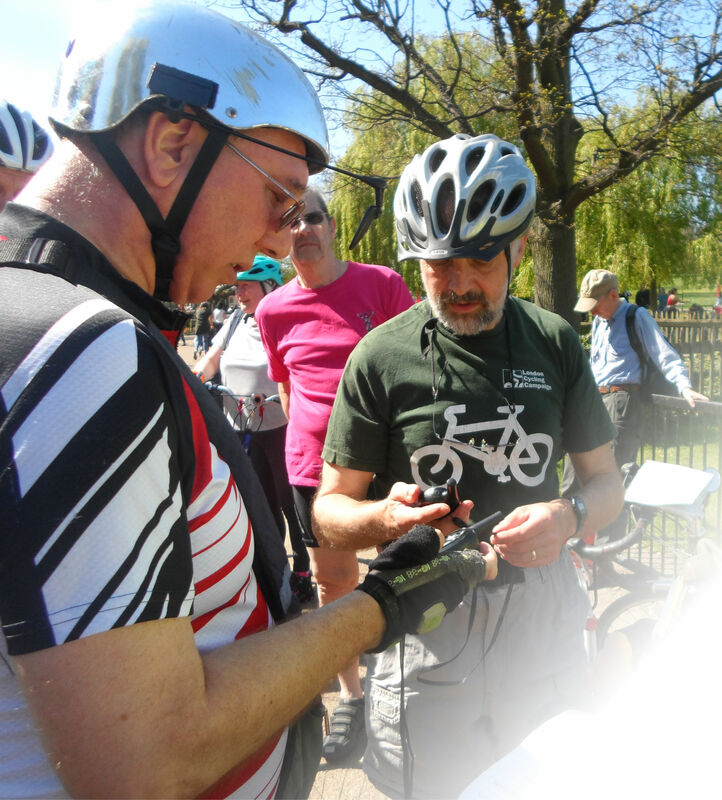 He had been aware that a lot a rides began at Sidings and he didn’t know where it was so took the opportunity to be guided there. 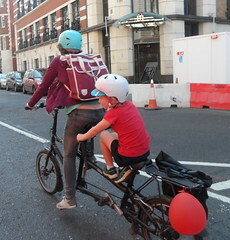 Of course, now he had to ride back to Holloway. 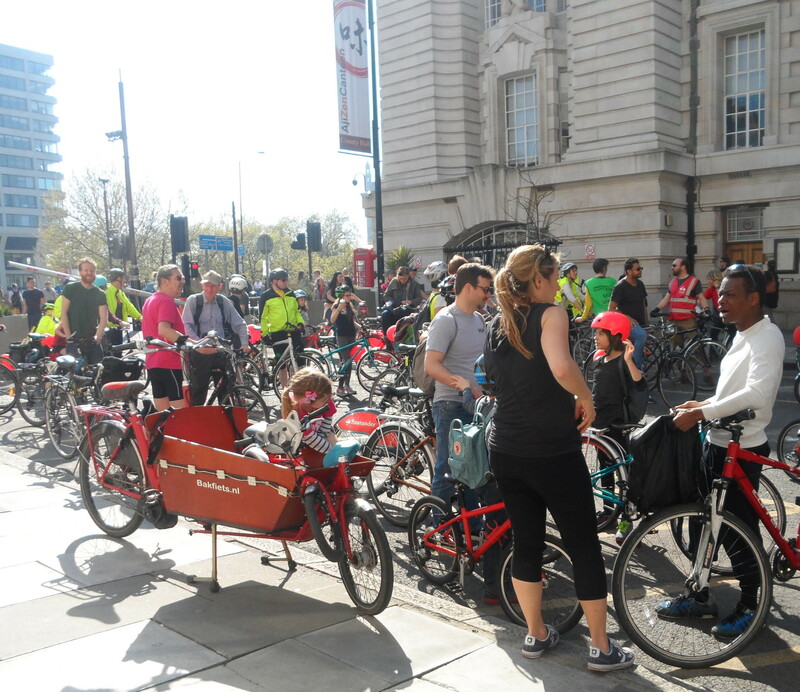 There are so many people to thank for being part of the organisation of this very enjoyable ride on a glorious afternoon. 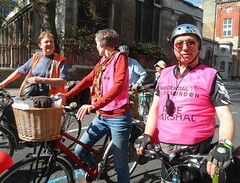 Alison Dines and Simon Izod of Cycle Islington who initiated the whole thing and planned the ride, John Chamberlain for leading much of the ride from Camden to Islington and back, Dave Fenn and John Hartley who did such sterling work as marshalls plus many more whose names I never got to know. Thanks also to Jenny Linn-Cole who used my camera to take most of the photos here and on Flickr. 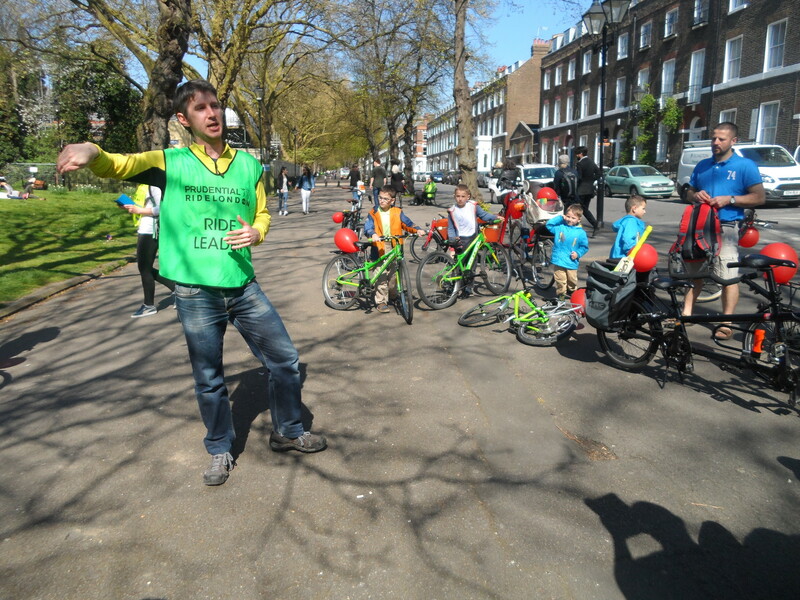 Thank you to all the people who came, young and old, beginner and experienced from all parts of North London. I always ask riders to comment on the rides. How was it for you? Please send me,. Geoff Stilwell, an email (geoffreyccc@gmail.com) with your comment and I will include it below as a testimonial on this page.